Kelly Zaleski, one of the organizers behind the Share the Love of the Game equipment drive, chatted with elementary school principal Shawn Kopp at Standing Stone Elementary Tuesday morning. Members of the community are being asked to “Share the Love of the Game” through an equipment drive to ensure that local children preparing to take to the baseball field this spring are well-equipped. The initiative originated last year and was spearheaded by two Huntingdon Little League moms, Julie Gutshall and Kelly Zaleski, as a way to help curb expenses associated with having a child playing a sport. Collection boxes for gently used baseball or softball related equipment, have been placed at both Southside and Standing Stone elementary schools, as well as in the lobby of J.C. Blair Memorial Hospital, Huntingdon. Fliers have been sent home with the students at both Huntingdon elementary schools to alert families to the gear collection effort. Financial donations are also being accepted. “Last year, we even had baseballs donated,” said Zaleski. Costs for sporting equipment can add up quickly and, compiled with the fact kids may hit a growth spurt mid-season, the gear they start out with may no longer be suitable later on. The items collected through Share the Love of the Game will be made available to anyone interested from 10 a.m. to 1 p.m. Saturday, March 2, at the J.C. Blair Education Center. Community members can also aid the Huntingdon Little League by checking out a special registry set up at Walmart.com to help restore the food booth which sustained heavy damage during last September’s floods. Most of the equipment stored within the booth was destroyed completely and will need to be replaced. To view the registry, visit www.walmart.com/lists/view-wedding-registry-items?id=8442614e-a54e-4756-afcc-dbc310bf90f7. “The food booth is the only way we make money. It’s our biggest fundraiser and helps us to buy things throughout the season,” said Zaleski. For more information, call Gutshall at 386-1291 or Kelly Zaleski at (508) 816- 9238. Following up on School Board Appreciation Week (Feb. 10-16), administrators thanked members of the Mount Union Area School Board during their monthly meeting Monday night. The board met at the Huntingdon County Career and Technology Center in Mill Creek, enjoying a meal and tour ahead of the monthly agenda. “Sometimes it’s a thankless job, but thank you for sitting on this board,” said high school principal Curt Whitesel. The district’s director of special education, Dianne Thomas, also extended her thanks. “I’d like to thank the board for its support to our administrators,” she said. Mount Union-Kistler Elementary principal Matt Franks also extended his thanks. Also Monday, the board approved adjustments to the school calendar due to inclement weather cancelations. Make-up days were approved for Tuesday, April 23 (for Jan. 31), Friday, May 31 (for Feb. 12), Monday, June 3 (for Feb. 20) and Tuesday, June 4 (for Feb. 21). In addition, an in-service half day originally scheduled for Friday, May 31, will now be moved to Wednesday, June 5. Board member Greg Dimoff asked Whitesel if the make-up days will impact graduation. During his report Monday night, Whitesel also noted there have been talks with Penn College to discuss students taking classes for college credits. The credits would be transferrable. He also gave credit to athletes, noting winter sports have concluded, with two wrestlers moving on to the state individual tournament. Spring sports start Monday, March 4. “And today is my twins’ 11th birthday,” he concluded, noting the girls asked him to mention their special day. Franks, during his report, informed the board his building scored 100 percent on a recent Positive Behavior Instructional Support (PBIS) evaluation. Elementary administrators also told the board of activities being held at the three schools this week in recognition of Read Across America. To close Monday’s meeting, board president Dolly Ranck congratulated Thomas and superintendent Amy Smith on the completing their doctoral program and graduation in December 2018. Smith thanked the board for its support and allowing her conduct research in the junior high school. Becky can be reached a bweikert@huntingdondailynews.com. Gray skies and diminished hours of daylight are enough to put anyone “in a mood,” but for some, the season can trigger depressive episodes that last for weeks or even months. According to the National Institute of Mental Health (NIMH), seasonal affective disorder (SAD) is a type of depression that typically starts in the late fall or early winter and goes away during the spring and the summer. Discerning a separation between SAD and major depression can be difficult. NIMH lists the symptoms of depression as feeling depressed most of the day — nearly every day, feeling hopeless or worthless, having low energy, experiencing loss of interest in activities once enjoyed, having sleep difficulties, experiencing changes in appetite or weight, feeling sluggish or agitated, having difficulty concentrating and having frequent thoughts of death or suicide. The symptoms listed for SAD are having low energy, hypersomnia, overeating, weight gain, craving carbohydrates and social withdrawal. Rivello encouraged those dealing with symptoms of depression — whether seasonal or not — to seek medical care and discuss it with their health care provider. Light therapy may also provide relief. Less daylight and inclement weather conditions can impede social interaction and physical activity, which in turn, can contribute to mood shifts with the change in seasons. A bill has recently passed the state House that could help those who receive unwanted telemarketer calls. House Bill 318, which passed with overwhelming bipartisan support, gives people in the state the ability to sign up for the “do not call” list without requiring them to sign up again in five years. State Rep. Rich Irvin, who voted for the bill, said this is a way to take care of some of the issues with telemarketing calls, but some of the issues surrounding telemarketing calls need to be addressed by the Federal Communications Commission (FCC). “For example, there’s spoofing, where they use a local number to make a telemarketing or robocall, that would almost have to be dealt with at the federal level,” said Irvin. Irvin said this is an issue he knows his constituents deal with on a regular basis, and he hopes it will curb the number of unwanted telemarketer calls, if the bill passes in the state Senate and is signed into law by Gov. Tom Wolf. He also discussed some of the additional measures on the bill. State Sen. Judy Ward said this bill was introduced in the state House when she still served as state representative, and she believes at one point, she was co-sponsor of the bill. Ward explained that the bill almost mandates that for those who sign-up for the do-not-call list, there’s a toll-free number that needs to be available for those who wish to sign up for it. She agrees the FCC needs to take more measures to curb robocalls and telemarketing calls by using the spoofing method. Ward said the next step for the bill would be to take it up in committee, and she’s hopeful it will move out of committee this time. The board of directors of Huntingdon County Business and Industry met Monday for their monthly meeting. Mincemoyer asked the board that if they know of people that are interested in business development in general or agritourism to contact him. He also expressed that if the concept takes off, they may form a subcommittee designated for the efforts. Tracey Cook gave an update for the investment committee. HCBI director Robert Reitman expressed that February has been another busy month for HCBI. “A key highlight was the All American grand re-opening last Friday. Christa McGeary kind of realized in December that they really needed a renovation. She came in and we looked at her books and we looked at her financial ability and we talked over what should be included while she was doing it. She updated her plan and got in touch with a contractor very quickly and she very quickly put together an entire business plan that gave it to us in a binder. I’ve never seen that kind of turnaround since I’ve been with HCBI,” said Reitman. “There’s still work to do in the front, but it’s going really well. It resulted in 22 extra seats, and Christa told me last Friday night when I stopped in for a pizza, that she hired three more people. That’s just an outstanding example of someone recognizing the need and reinvesting in their own business and reinvesting in the county. I thank that’s a really good picture of what people can do when they see that rapid return. It doesn’t always happen that quickly, we’ve seen very organized businesses take a lot longer than that. It’s proof that if you have all of your ducks in a row, you can execute really quickly,” said Reitman. Ed Stoddard of the Huntingdon County Visitor’s Bureau presented the 2019 visitors guide to the board. “Some new things this year, of course there is some editorial in the front, it’s very much focusing on family fun in the Raystown Lake region. Another new thing we’ve got this year is we’ve reformatted our maps in a pull-out poster. Myself, a group of Juniata College students, and Huntingdon County mapping departments put together the maps of the area this year,” said Stoddard. Stoddard informed that the visitor’s guide is available at many locations throughout the county, as well as rest stops in surrounding areas, and even via direct mail to those who request a copy. The board heard updates from representatives from the offices of state Sen. Jake Corman, state Sen. Judy Ward, and state Rep. Rich Irvin. Each of the county commissioners gave a report on the initiatives they are currently working on for the county, which included the elevation of Route 453 to National Highway status. 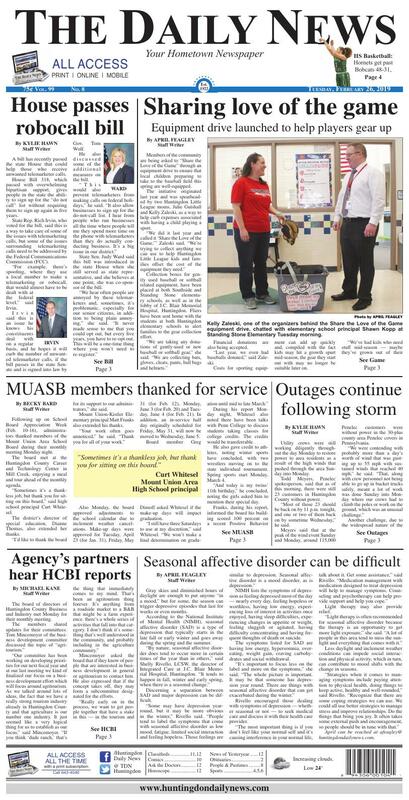 Reports were also heard from the Huntingdon County Chamber of Commerce, PA CareerLink, and Juniata College Center for Entrepreneurial Leadership. The next meeting of the board of directors at HCBI will be Monday, March 25, at the J.C. Blair Education Center. Utility crews were still working diligently throughout the day Monday to restore power to area residents as a result of the high winds that pushed through the area Sunday into Monday. Todd Meyers, Penelec spokesperson, said that as of this morning, there were still 23 customers in Huntingdon County without power. “Most of those 23 should be back on by 11 p.m. tonight, and one or two of them back on by sometime Wednesday,” he said. Meyers said that at the peak of the wind event Sunday and Monday, around 115,000 Penelec customers were without power in the 30-plus county area Penelec covers in Pennsylvania. Another challenge, due to the widespread nature of the winds that affected Pennsylvania and some surrounding states, Penelec was unable to get utility workers from other subsidiaries of First Energy, the parent company of Penelec, to help in Huntingdon County. “We couldn’t release those workers because it was so widespread,” said Meyers. It seems as if crews from Valley Rural Electric Cooperative had also hit the home stretch as of this morning, as 50 member accounts are still without power in Huntingdon County, out of the 62 in the Valley Rural service territory. The outages include six in Barree Township, one in Brady Township, one in Henderson Township, one in Hopewell Township, one in Oneida Township, one in Jackson Township, four in Springfield Township and 32 in West Township. The remainder of the outages are in Juniata County. “Our crews put in some long hours, and we’re still tracking down smaller outages,” said Doug Roles, vice president of member services for Valley Rural Electric Cooperative. “There are instances were we have our line crews go out, and they fix one line of power, and we get multiple members back online with one repair job. Now we’re down to the smaller jobs where we have a member here or there where service has dropped, and we go to their house and one or two accounts go back online. Some reports also indicated that Comcast customers were without service due to the wind event Sunday and Monday, and some Comcast crews were seen throughout the day Monday at the Crooked Creek area in Smithfield Township working to restore service. No widespread outages from Comcast were reported to the Huntingdon County Emergency Management Agency office, according to Joe Thompson, EMA director. Thompson also noted the most significant damage reported to his office Monday from local emergency management coordinators (EMCs) was a tree that went into a dwelling in Walker Township. Officials have wrapped up reports from EMCs as a result of the storm. Other damage as a result of the storm, from what Thompson has received, included some roof damage and carport damage.